Submissions close 11.59 PM AEST 17 May 2019. Australian Poetry Journal 8.2 (poetry guest edited by David Stavanger and Andrew Galan) is now available. Australian Poetry Anthology Vol 7 2019 will be available in May. SUBMISSIONS ARE NOW OPEN FOR APJ 9.1 – ‘RESIST’. POETRY GUEST EDITED BY JOHN KINSELLA. “This is an immediate response to environmental degradation verging on complete collapse, on issues of injustice and unfairness in our various social spaces, and a challenge to institutional bigotry, brutality, and indifference. Issues of injustice are not separate, but are in dialogue. Published with the support of Australia Council for the Arts Projects Grant 2019. The volume will also include reviews and articles. Publisher is Jacinta Le Plastrier. We are committed to prompt turnaround on the reading of poems. All poets who submit within the guideline submission dates will be contacted in June with acceptance notices ONLY. If you are not contacted, this means regrettably that your poetry was not selected. APJ in 2017 introduced a submissions policy, with its new guest editor model, where the guest editor/s can organise submission for a number of poets directly each volume. 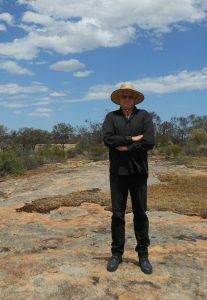 John Kinsella at Gathercole Nature Reserve, Western Australia. Photo by Tracy Ryan. John Kinsella is the author of many volumes of poetry, including Peripheral light: New and Selected Poems (WW Norton/Fremantle Press), Jam Tree Gully (WW Norton), Drowning in Wheat: Selected Poems (Picador) and most recently, Open Door (UWAP), the final volume of his Jam Tree Gully trilogy. He has written numerous books of fiction and criticism, including Polysituatedness (Manchester University Press) edited others, and taught poetry and literature in a number of countries. He has published six collections of short fiction, including In the Shade of the Shady Tree (Ohio University Press) and Crow’s Breath (Transit Lounge), and his experimental novels include Postcolonial (Papertiger Media) and Lucida Intervalla (UWAP). His a a Fellow of Churchill College, Cambridge University, and Professor of Literature and Environment at Curtin University. He lives mostly in the Western Australian wheatbelt on Ballardong Noongar land, and is a committed environmental and social activist and a vegan anarchist pacifist of well over three decades. He frequently works in collaboration with other practitioners and activists.